Automotive Evaporative Emission Control System Market size valued at USD 46 billion in 2018 and is estimated to exhibit 5.5% CAGR from 2019 to 2025. Rising solar radiation and ambient temperature across the globe increases the fuel tank temperature. High tank temperature results in the evaporation of petrol with a consistent increment in the internal pressure causing fuel expansion. According to Environmental Protection Agency (EPA), two-wheelers loose around 2%-5% fuel due to high temperature. 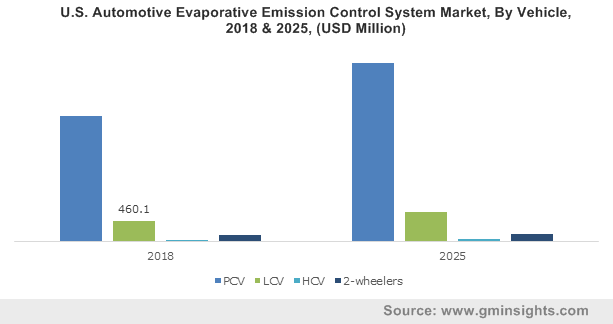 Rising fuel losses and air pollution owing to evaporative emission will drive the automotive evaporative emission control system market size over the forecast period. Stringent government standards focusing on reducing evaporation of volatile organic compounds and tail pipe discharge is propelling the product demand. Regulatory standards such as California Air Resources Board (CARB) are emphasizing on controlling carbon monoxide, hydrocarbons, and nitrogen oxide pollution for improving air quality, leading to automotive evaporative emission control system market expansion. Regulatory entities such as United Nations Economic Commission for Europe (UNECE) are introducing vehicle testing procedures to check vehicular pollution. For instance, in 2017, UNECE introduced Worldwide Harmonised Light Vehicle Test Procedure (WLTP) to control fuel consumption, pollutant emissions and evaluate on-road performance. Such initiative will induce significant potential in the market size over the forecast timeline. Emergence of stringent government regulations is leading to development in vehicle fuel system. For instance, in 2015, CARB reduced the running loss (grams per mile) for passenger cars and light-duty trucks to 0.05. Vehicle manufacturers are replacing the Stage II vapour recovery system with onboard refuelling vapor recovery (ORVR) systems for superior monitoring and emission control efficiency. Automobile manufacturers are extensively investing in R&D to innovate cleaner vehicles technologies driving the automotive evaporative emission control system market share. Industry participants are combining on-board diagnostic sensors with the vehicle fuel system for efficient functioning of the system. Introduction of advanced system integration with EVAP will drive the industry size over study timeframe. Rising adaption of hybrid and electric vehicles will restrict the market size. Increasing government initiatives such as tax rebate and development of supporting infrastructure is shifting consumer inclination towards the alternate vehicles. Further, ongoing steps to reduce vehicle ownership cost will hamper the automotive EVAP system market growth till 2025. Heavy commercial vehicles will showcase significant growth over the projected timeframe owing to proliferating logistic and construction industry. High evaporative and tail pipe pollution from HCVs is encouraging the vehicle manufacturers to incorporate EVAP systems. Further, rising freight transportation demand with increasing trade activities will support the segment penetration in next six years. In 2018, two wheelers accounted for over 35% share in the automotive evaporative emission control system market size on account of their relative affordability and higher fuel efficiency. In addition, rising two wheelers demand for personal and commercial transportation in emerging nations will drive the industry size. According to Society of Indian Automobile Manufacturers, (SIAM), in 2017, the two wheelers production increased by around 16% as compared to 2016. Canister will account for a significant share in the automotive evaporative emission control system market size over the study timeframe. The product traps the vapours produced by the petrol evaporation contained in the fuel tank until getting soaked by the activated carbon. Component manufacturers are implementing EPDM foam in canister to enhance the adsorption efficiency for petrol. Adaption of high efficiency components in the EVAP system will drive the segment penetration over the study timeframe. Liquid-vapor separator will exhibit a considerable growth in the automotive market share owing to its fitment to prevent petrol from entering the EVAP canister. The component enhances the canister’s capability to store fuel vapours and reduces the risk of canister overloading. OEM holds a significant volume share in the automotive evaporative emission control system market on account of advanced technology innovation and adoption of systems to adhere to vehicular pollution standards. For instance, industry players are developing highly efficient advanced canister modules including advanced electronic controller and electrically-heated hydrocarbon scrubber, strengthening the segment share. Aftermarket segment will witness considerable growth in the automotive EVAP system market size owing to rising incidences of defects in emission control system. In addition, emerging aftermarket in emerging nations for damaged automotive components related to evaporation emission control will accelerate the segment expansion. 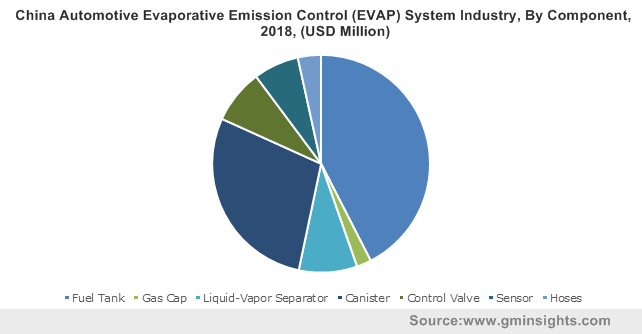 Asia Pacific leads the automotive evaporative emission control system market size owing to increasing vehicles production to meet consumer demand. Rising government initiatives for reducing vehicular pollution and clean transportation will induce significant growth potential in EVAP industry. In September 2017, South Korea introduced RDE test procedure for automobiles to measure emissions from petrol fuel vehicles. Europe will showcase over 6% CAGR in the market size owing to presence of major industry players. Ongoing initiatives by European Commission emphasizing on greenhouse gas reduction and air quality protection will further drive the product demand. 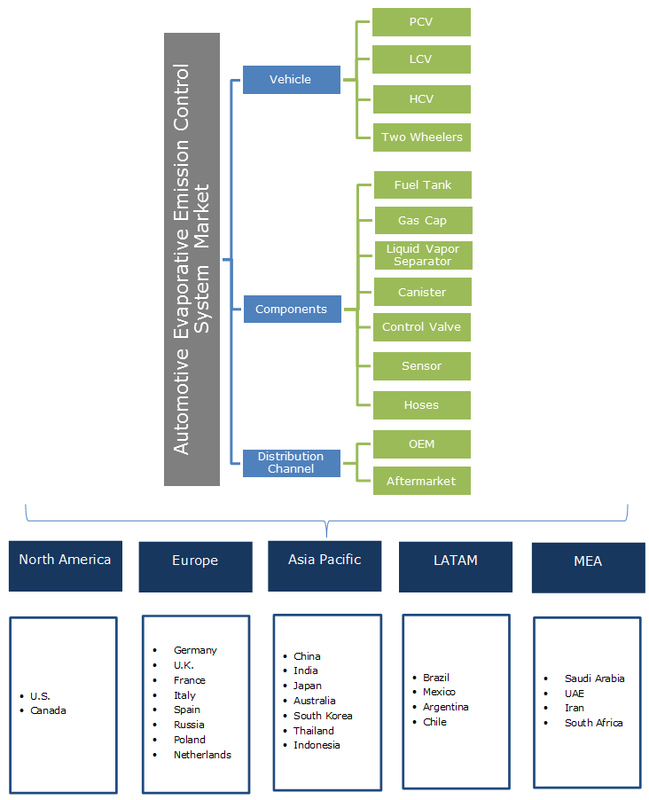 Major players in the automotive evaporative emission control system market includes Delphi Technologies, Didac International, Eagle Industry Co., Ltd., TI Automotive, Padmini VNA Mechatronics Pvt Ltd, Plastic Fuel Systems, Robert Bosch, Sentec Group, Standard Motor Products Inc, Stant Corporation, The Plastic Omnium Group. Industry participants are expanding the manufacturing facilities to enhance production capability. For instance, in June 2016, TI Automotive introduced advanced fuel tank systems manufacturing facility in China to increase production and strengthen its presence in Asia Pacific. Automotive evaporative emission control industry is majorly driven by regional and international organization concerns regarding vehicular emissions. The government entities such as EPA, CARB, and Manufacturers of Emission Controls Association (MECA) produce substantial challenges and opportunities for automotive manufacturers in combination with other objectives including fuel performance and economy. Major methods utilized for fuel vapor recovery includes ORVR and vapor recovery systems (VRS). OVOR system is installed in vehicles for non-refuelling conditions and VRS for refuelling process.